Monday evening, Texas Governor Rick Perry stepped up and drew a line in the sand challenging the TSA's authority to conduct invasive and unwarrented searches of Texans by issuing a proclamation granting the Texas Legislature the authorization to consider and approve legislation relating to the prosecution and punishment for official oppression of persons who violate the law by unlawful and unwarranted searches and groping. The bill, now titled HB 41 (SB 29), is a re-write of the widely popular HB 1937 which did not pass out of the regular legislative session. It will stop the Transportation Security Administration (TSA) from utilizing invasive pat-downs of traveler's private parts unless there is probable cause that traveler has committed some kind of offense. See Related Stories from TexasGOPVote. This represents a victory for the people of Texas who wanted to see this issue dealt with during the regular session. Much pressure was applied to Gov. Perry by thousands Texas voters, Lt. Gov. David Dewhurst, Texas Senator Dan Patrick and State Representative David Simpson who authored the original bill and the current proposed legislation and people from around the world. In a recent exclusive interview with Lt. Gov. Dewhurst, we discussed his solid support for this bill. Gov. Dewhurst told me, "This is a problem that’s too serious not to solve. I don’t want anybody or their family members or friends to go through a traumatic experience, especially when it’s a random search without probable cause." Dewhurst continued, "I’m a law-and-order man. A random search without probable cause, to me, is unconstitutional and it's a violation of the 4th Amendment." When someone enters the secured area of an airport they are subject to the rules of that screening process. If you don't go through the scanning device you are subject to being patted down by the TSA agent. Dewhurst said, "What we're talking about is different from a pat-down. We're talking about invasive groping that causes trauma to men, women and children." "I feel very strongly about stopping unwarranted and unconstitutional violations of our privacy. I find the TSA’s policies of random, invasive, and intrusive searches with no probable cause to be horrific. I don’t normally curse, but I’d be mad as hell if my wife was groped or my little girl was groped, because I know there is no probable cause there," Dewhurst continued. Dewhurst concluded by saying, "We all want our skies to be safe. We all want to fight terrorism. But, let’s focus on the bad people. Our main interest is to send a message to TSA to change your policies." Currently the bill has 112 House members who have co-authored the bill. It passed unanimously out of the House committee on Criminal Jurisprudence on June, 14th. In a written statement yesterday, Lt. Gov. 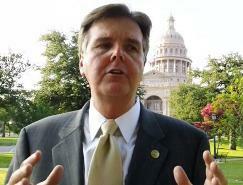 Dewhurst added, "I'm very pleased that Governor Perry agreed to add this legislation to his Special Session call. Addressing unreasonable and unlawful searches of innocent travelers by some TSA employees is an issue that affects all Texans who use air travel, and it should not wait until next Session." "The Obama Administration overstepped its bounds by implicitly threatening to shut down air traffic in Texas if we passed this bill. After working closely with the Attorney General's Office the last few weeks, I'm confident that we can pass legislation that addresses these threats, while protecting innocent passengers and preserving our state's rights." Following is a letter received from the Office of the Texas Attornety General. Click the image to see the full sized letter. The original author of the anti-groping bill, State Representative David Simpson (R-Longview) in a written statement said, "This is a significant step forward for the people of Texas—for their dignity and liberty. Thousands of Texans are grateful that Governor Perry has taken the lead in defending the 4th Amendment rights of all of our citizens." "Sam Houston said that Texas has yet to learn submission to any oppression, come from what source it may," Simpson continued. "While Washington is content to ignore the Constitution and trample on innocent travelers‘ rights and dignity, we in Texas will not stand idly by." 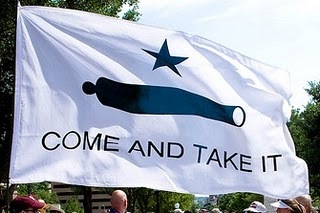 "Now the citizens of Texas—and even the nation—are watching to see if Texas lawmakers will stand tall with Governor Perry for the constitutional rights and the dignity of our people," stated Simpson. Senator Patrick said in his statement about the Governor's announcement, "JoAnn Fleming and an army of Tea Party folks across the state contacted the Governor. Republicans, Conservatives, Independents and, yes, Democrats all joined with Rep. David Simpson, the Lt. Governor, and me to urge the Governor to add this issue to the call. Thank you, Governor Perry." Sen. Patrick continued, "There is another person I want to thank. A person I do not know named Wesley. I had sent a short personal letter to the Governor last Wednesday morning, followed by a call to his office, that I had the votes to pass the bill in the Senate once again. The Governor was traveling all week and was not aware that we had regained the votes in the Senate. One person can make a difference." Sen. Patrick referred to a video of a conversation between Gov. Perry and Mr. Wesley Strackbein where Mr. Strackbein asked Gov. Perry to add the TSA issue to the special session. Here is that video. Now is the time to follow Wesley's lead and make a difference. Call your state senator and representative and tell them to pass the new TSA anti-groping bill.